Overlooking a private beachfront, Ozran Heights offers exclusive cottages situated in tropical landscapes. Featuring free Wi-Fi and parking, it has a restaurant with outdoor dining area and water sport facilities. Featuring private balconies and flat-screen TVs, sea-facing cottages at Resort Ozran Heights offer spacious layouts and wood furnishings with a natural finish. A safe and electric kettle are provided. Lazy days in the sun can be spent on the daybeds provided. Alternatively, go on a fishing or day trip organised by the tour desk. Offering sweeping views of the Arabian Sea, Restaurant Zaffran serves Indian specialities. Enjoy cool sea breezes while taking in the sights of the open kitchen. Shopping options are available at Anjuna, a 10-minute drive from Ozran Heights Beach Resort. 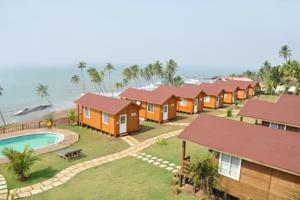 It is 59 km from Dabolim Airport and provides airport transfer service. Free! All children under 5 years stay free of charge when using existing beds. One child from 6 to 12 years is charged INR 499 per night and person in an extra bed. One older child or adult is charged INR 907 per night and person in an extra bed. There is no capacity for cots in the room. Supplements will not be calculated automatically in the total costs and have to be paid separately in the hotel.